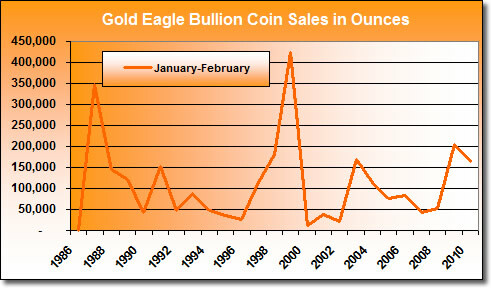 The latest United States Mint bullion coin sales figures have been released and the stats show authorized buyers purchased 84,000 American Eagle Gold coins during February 2010, which was 1,000 less than the prior month. Atypical from other years is that the tally includes both 2009 and 2010-dated coins. This year was the first time in the U.S. Mint’s history of selling the gold coins that a current year’s eagles were not offered during the first week of January. Exceptional demand for the eagles in 2009 resulted in a delayed release of 2010s. 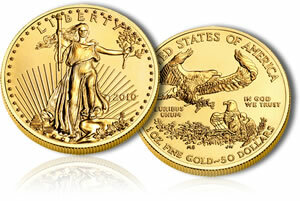 The US Mint announced on January 13 that it had 51,000 of the 2009-dated eagles in inventory, and that buyers had to order one for every three 2010 Gold Eagles. Those went on sale January 19, 2010. The Mint typically halts production of a current year bullion coin by late November to begin production of the next year’s issues, leaving on-hand supplies to fulfill demand. However, the Mint was never able to build a sizeable stockpile, and resultantly struck 2009-dated eagles late into last year. 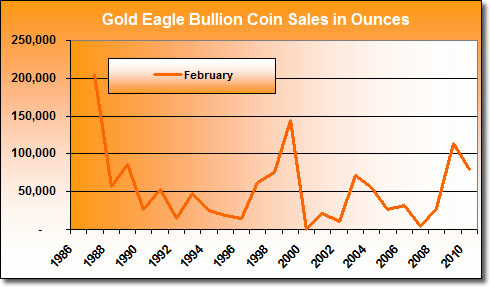 This year the ranging price of gold is affecting demand, seller inventory levels, and Gold Eagle values. The yellow metal premiered at just above $1,120 to start 2010. Prices rose to over $1,150 within the first week, but then retreated toward $1,058 by early February. Gold has since returned to the $1,120 area, but is now hovering around $1,116. Both buyers and sellers have been cautious given gold’s volatility. For additional information on this year’s eagle, to include coin specifications and design details, visit the coin information page 2010 Gold Eagle Bullion Coin. The Mint does not sell its bullion coins directly to the public. Instead, it works with a small number of authorized purchasers who in turn resell the coins to precious metal providers, investors, dealers and collectors. These coins do not have a mint mark, unlike their numismatic proof and uncirculated counterparts struck specifically for collectors.